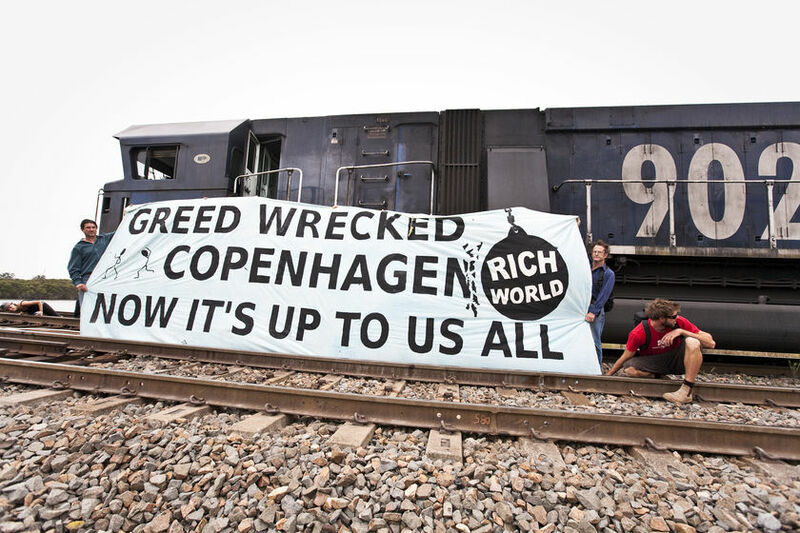 Some 40 activists with Rising Tide Newcastle shut down the railway line leading to Australia‘s biggest coal export facility for six hours yesterday to protest the failure of global climate change talks in Copenhagen. 23 people were arrested after police removed them from the human blockade. Two Greenpeace activists got past security at a formal state dinner at Christiansborg palace in Denmark where Queen Margrethe II hosted world leaders on Friday. They waved banners saying “Politicians Talk – Leaders Act,” in the reception hall of the palace before being evicted. Greenpeace declared the US Chamber of Commerce headquarters in Washington, D.C. a “climate crime scene” on Thursday to protest the business federation’s continued dismissal of global warming. Activists scaled the Chamber’s building and draped it in yellow crime scene tape, while simultaneously surrounding it with vehicles designed to look like police units and ambulances marked “Climate Crime Unit”. Thousands of people took to the streets of southern Yemen on Friday to protest a recent military operation against suspected al Qa’eda militants which claimed the lives of dozens of innocent civilians. About 40 people protested the University of Pittsburgh Medical Center’s decision to close a hospital in Braddock, PA by marching on the non-profit’s corporate headquarters on Friday dressed as zombies and pushing hospital IV stands. Thousands of people marched in Taiwan yesterday to protest the government’s secret and non-transparant meetings with political rival China, a day before Beijing’s top negotiator arrives on the island for talks on a landmark free trade pact.